A mother-of-two died and her son aged 16 was seriously hurt in a jump from a first floor window, when flames engulfed a Berkshire home. Fire crews were called in the early hours to Wayside Mews in Maidenhead to reports of people trapped in the first two floors of the burning home. The 47-year-old woman was pronounced dead at the scene. Her husband and daughter also jumped from windows. The 18-year-old and her father are both in a stable condition in hospital. 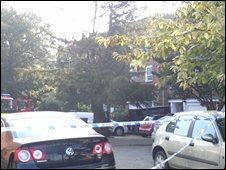 The fire service said neighbours and relatives were shouting at the woman to persuade her to jump before she died. A police spokeswoman said: "Police have investigated the incident and are happy the fire was not suspicious. "We have now handed the inquiry over to the fire service."